Natalie Buckley-Medrano joined the Quail Springs team in Fall 2017, excited to continue to learn, practice, and teach soil regeneration techniques through holistic food systems management. She is passionate about dryland farming and designing systems for both the sequestration of vast amounts of carbon and healthy integration of plants and animals. Her part in mitigating climate change is promoting and learning more about how best to feed the soil as it feeds us. Natalie grew up in Los Angeles county, playing on asphalt parking lots at recess. Over time, she recognized a central pillar of our societal ills – the lack of connection to the natural world and food production. Driven by this awareness, she concentrated her studies on urban planning and land use law while attaining her bachelors degree in Environmental Studies from UCSB. After college, these passions led her to work in agriculture, horticulture, and arboriculture with jobs in independent garden design, organic vegetable farming, and greenhouse & nursery work. She farmed in New Zealand, Southern California, and Boston, practiced tree propagation at the Arnold Arboretum of Harvard University, and – to mix it up a bit – apprenticed on a cob house build at Spirit Pine Sanctuary. 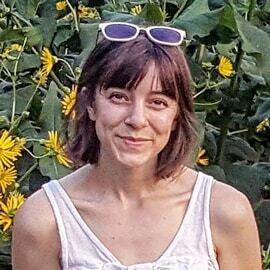 Natalie has also gone deep in the study of permaculture: completing a PDC through the Sustainable Vocations program at Quail Springs, an Advanced Permaculture Design course with Lisa Fernandes at the Resilience Hub in New England, and a Permaculture Teacher Training with Pandora Thomas and Lisa DePiano. The Quail Springs crew is excited about Natalie becoming another powerful female voice leading permaculture forward.